Card Blank-The Paper Co. Value Pack-Hobby Lobby, Basic Grey paper pad-Cupcake, Am. 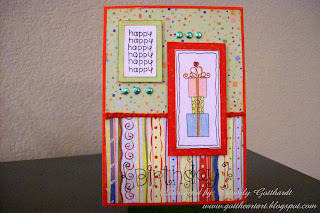 Traditional Scrapbook Bundle-Celebrate, Stampin Up Whisper White paper, Ink: Stampin Up Tangerine Tango, Ranger: Archival Ink Jet Black, Stamps: Doodlebug Birthday-T, Pastel Chalk Pencils, Metallic Dots: Jo Ann's, Pop Dots, Sticky Stitches(self-adhesive stitches by the inch, Rember When). Super card! You didn't have to start over, but you did a great job :). Thanks for playing along with our sketch! I hope you'll join us again tomorrow!